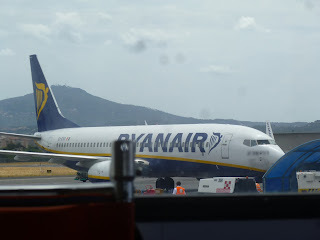 Our flight to London was scheduled to leave from Ciampino Airport at 11:15 am; perfect time for us, if we had been in Ciampino! But as travel planning went a bit awry, when booking this portion of our travel plans, we were staying in Fiumicino, twenty miles away. This was no huge deal, as we were able to get a taxi to take us to the other airport, with no major inconvenience. We ordered the taxi to pick us up at our hotel at 8:30 am, giving us more than ample time to allow for traffic. 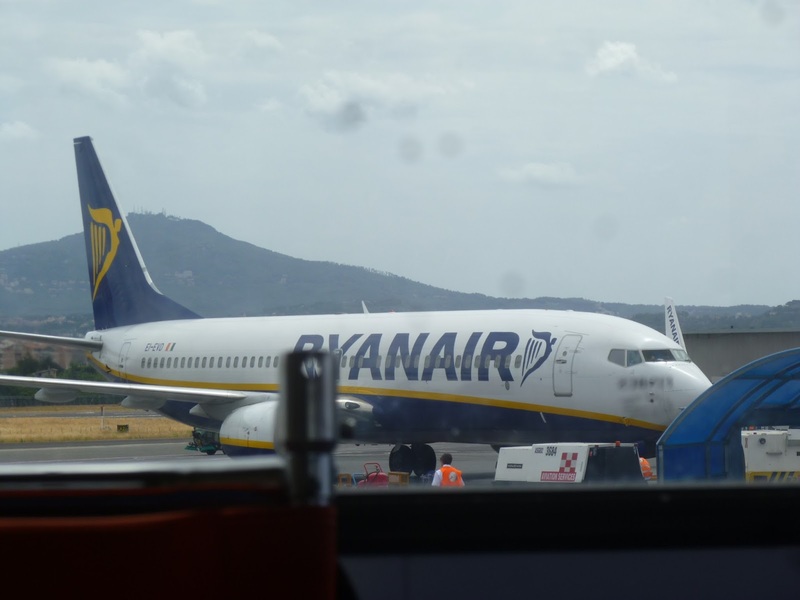 We made it to Ciampino in record time and were two hours early for our flight. 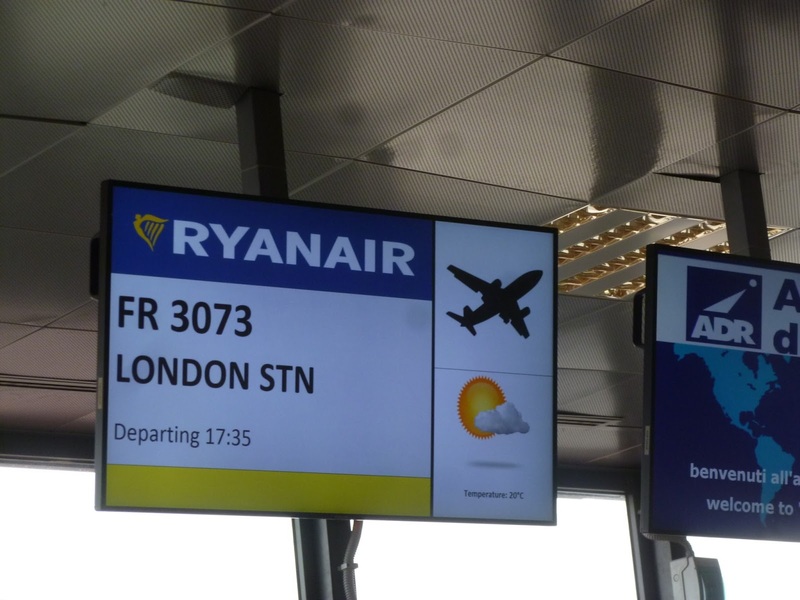 Fortunately, I had pre-ordered a wheelchair, which allowed us to skip the extremely long line at the Ryan Air ticket counter, which was also the place you had to go to check your baggage. I asked the gal at the ticket counter to print my boarding pass, and she refused; I did have it on my iPad, but it was not super convenient to use. 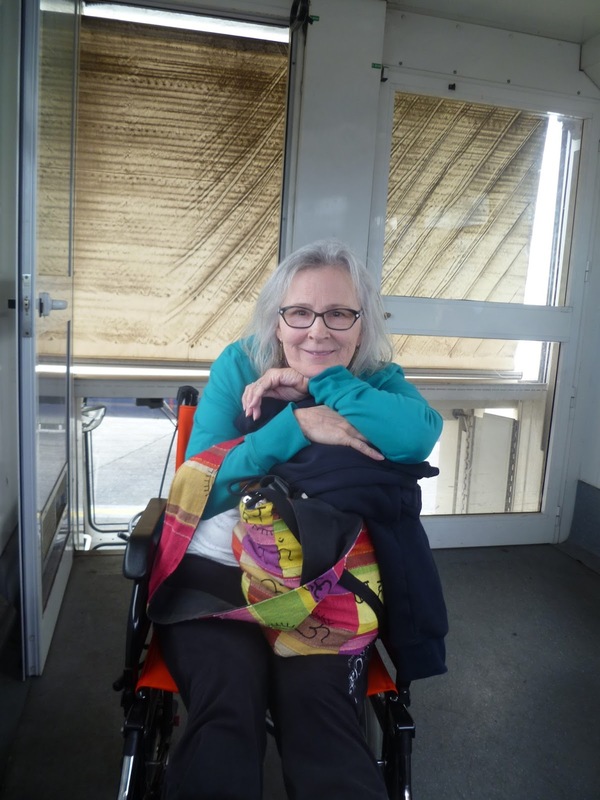 The wheelchair and driver arrived shortly after we gave her our bags, and we continued to security; when we got there, they tried to scan the boarding pass on my iPad and it did not work; they insisted on having a printed boarding pass, which I was previously refused. I told the security gal that the ticket gal would not print one, so she sent my husband and the wheelchair driver, back to the ticket counter to obtain one; stating she HAD to print it. This should have been an omen of what was to come! Once the wheelchair dude and Joe arrived back at security, we passed through to the conveyor belt; my wheelchair guy was insistent that I stay put and that he would put all of my "things" on the belt and "Not to worry", so I sat. Eventually, after several bags were hand-checked, we were on our way to the gate; grateful for the ride, as it was quite a distance. The attendant pushed me towards the area where we would be loading the plane and told us he would be back when the time came to load us on the aircraft; which was currently delayed an hour; our first delay on our extended trip; not too bad. 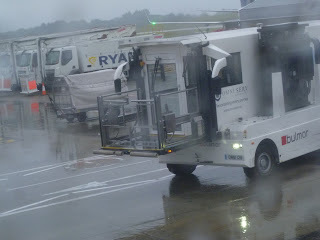 As boarding time quickly approached, I noticed another lady in a wheelchair, right behind us; the attendants came and loaded us onto this "lift truck", which was very interesting. They drove us out onto the runway, and just as they were getting ready to put us on the plane, their radio beeped and told them to turn around; there was apparently something wrong with the plane, and we would not be boarding, just yet. What a production! They lowered us back down, and then drove us back to the terminal; wheeled us out and said, "We will be back, when they are ready to load the plane." Which was now delayed ANOTHER hour! 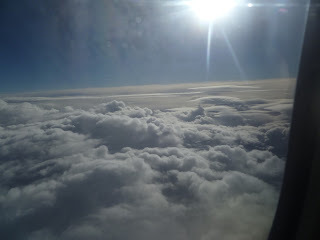 I quickly said that that was ok, as I did not wish to be on a plane that had issues and I was glad that they found these issues, before we boarded and most definitely before we took off. By this time I was utterly and completely fatigued and literally fell asleep, sitting in the wheelchair, while Joe stood in the boarding line, for hours! The departing time eventually went to 5:30, and then just went blank. All of the people on our flight watched plane after plane take off; all to London, as we sat in Rome. Eventually, a Ryan Air representative came out and told everyone that they were sorry for the delay, and that they were offering a sandwich and drink from a vendor, just outside of the security area, and that because there were not any flights coming or going for a few hours, that the secure area would have to be vacated and that we would have to go back through gate security, after we ate; fortunately this was just a passport check, and not the whole carry-on x-ray, conveyor belt scene. Joe got in the sandwich line and I found a seat at a table, with other passengers; the other woman in the wheelchair managed to make her way over to me and we started chatting. She was a delightful woman who was on her way to London, for Canada Day. It seems that she is a Canadian, who married an Italian, and lived part time in Rome, and part time in Canada. She was actually part of the musical program, in London, for Canada Day, and had much work to do, before the performances, the next day. I am guessing that she is quite a force to be reckoned with and has been standing up for the rights of musicians, her entire life; she told me so many stories about her life and how she had to fight every step of the way, as a woman, in an industry full of men. She said that now is the best time of her life because she just says everything and anything that she chooses, and no one dares to cross her because she is that "crazy, old lady"! I enjoyed her immensely and was so impressed that at her age, she was still all about get up and go, and she didn't let anything stop her. I mean think about it, an 80 plus year old, travelling from country to country, all alone; fighting for rights of musicians and setting up performances on a huge scale; I was impressed! 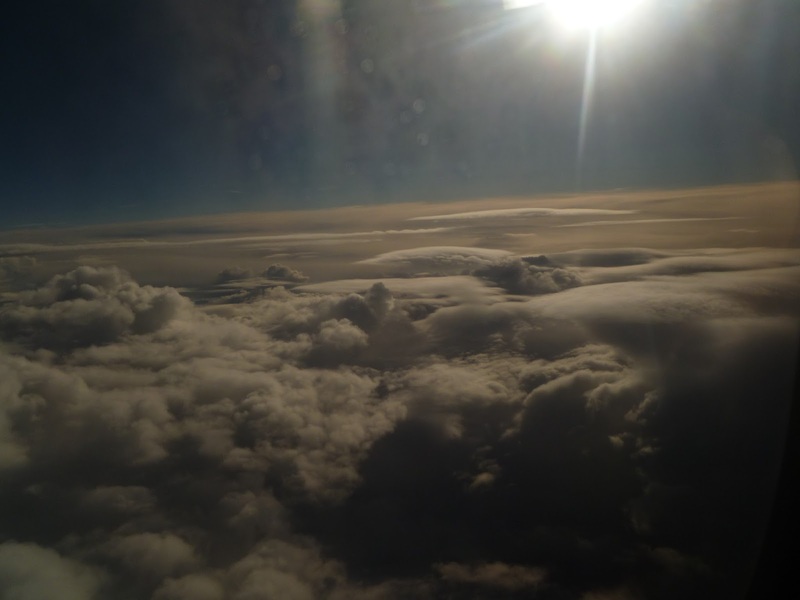 While we were sitting there talking, the people at the table next to us chimed in and we started to talk about the delay; they told us that any delay, over three hours, required the airline to pay compensation to its' travelers. This perked up my ears, and I asked them for more info; they told me to ask for a pamphlet from the airline and to apply online, for the compensation. Which I did, as soon as I got home. After several hours, we made our way back through the passport check and saw that our new departure time was 7:30; they had a new plane, and were waiting for pilots and crew. Joe and I were in contact with the gentleman, whose apartment we were renting, to keep him informed of our delay. Then, all of a sudden, things started to happen! The wheelchair guys showed up, loaded us onto the wheelchair lift, and we headed out to the plane on the runway; this time we actually boarded the plane, and once I was settled in my seat, I was out! The flight was finally underway and we were finally headed to London; as I slept. 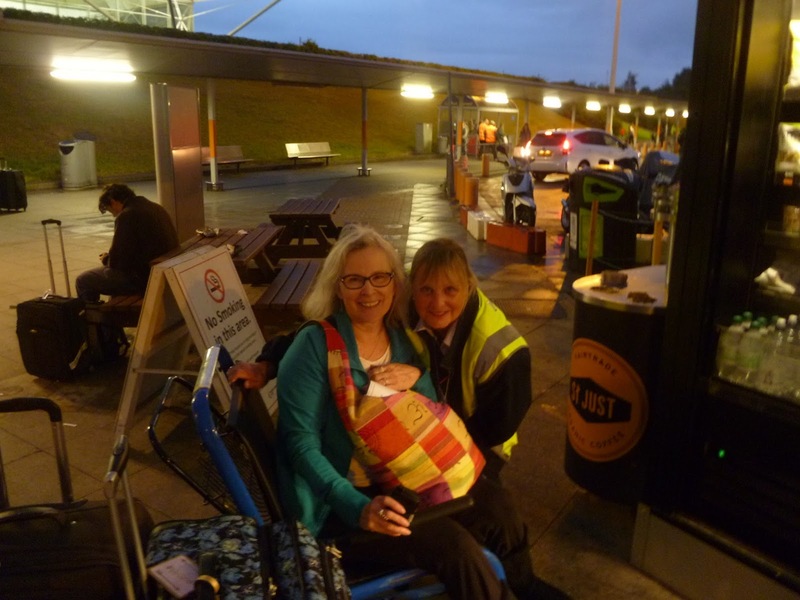 Once we arrived at Stanstead, another wheelchair angel showed up. This was MORE than a blessing, as the custom lines were long, and the baggage claim was mile away. I found that having a personal guide to take you through customs and to baggage was more than I ever could have hooped for, and it saved me many, many agonizing steps, and standing in long, long lines; I am remembering to take these small things in stride and to stop beating myself up for using these services. The gal pushing my chair was the most amazing travel angel we had met thus far, and that is saying a lot, as they have mostly all been pretty awesome. She started giving us tips on London after profusely welcoming us into her country. She asked where we were staying and how we were getting there. I told her I had purchased a National Express Bus ticket, to take us into the city, but that was for a bus that left hours and hours ago. She said not to worry, that they would likely credit the amount that we paid, and just charge us an additional fee to change the ticket; this was a relief. So this travel angel, not only took us to baggage claim, waited for us to get our luggage and then took us all of the way out to the bus station, she continued to give us tips and suggestions, all along the way. As she suspected, the bus company did honor our previously purchased tickets, and only charged us about $12 to "refresh" those tickets, which I had only paid $8.60 for (for two tickets) so we were thrilled; the next bus left in about 20 minutes, so our travel angel left us, and the wheelchair, and told us not to worry about it, as someone would pick it up, after we got on the bus. She was the BEST and I told her so; she made our long, long day brighter. 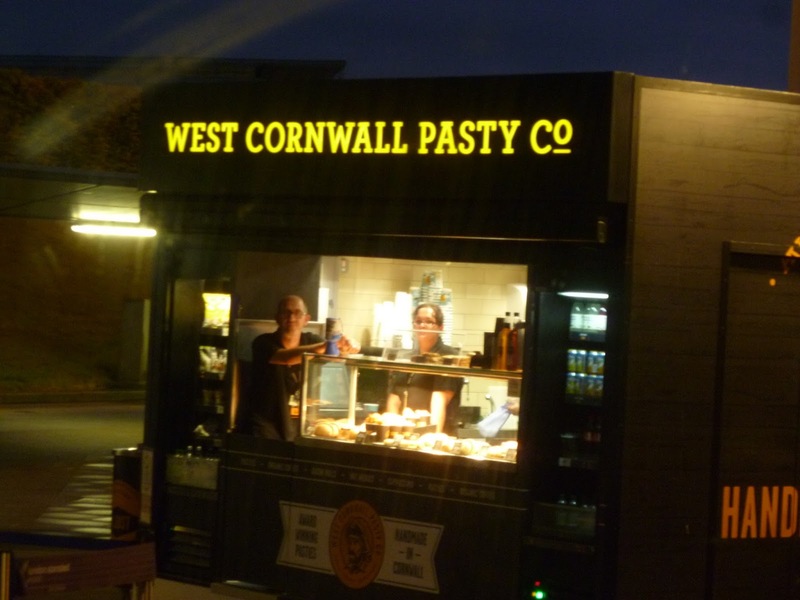 Since we had twenty minutes, and were starving, we were lucky there was a West Cornwall Pasty kiosk, right there!! Our first meal in London, and it was delicious! We had a Beef and Ale and some sort of Thai pasty, and we ate and enjoyed, the WHOLE thing. Getting on the bus, heading to London, was a small victory. We still had to get to Liverpool Street Station, then on the tube to Marble Arch, and then walk to our apartment; at this point, we figured that it would be near midnight when we finally arrived at out "London home." There was no point in crying over the fact that we had lost an entire day of sight seeing, or the fact that we literally had no idea where we were actually going, so we just enjoyed the bus trip. After about an hour, we got off the bus and headed to the tube. It was easy to purchase a seven day tube pass and we easily figured out which platform to take, to get to Marble Arch. Pushing suitcases, through a train terminal is never much fun, but I did marvel at the fact that their were so many people, on the move, at 11 pm, with and without suitcases, that it didn't bother me one bit. I was so relieved to finally be close to our destination, that I pushed and pulled with a smile on my face. We managed to get on the correct train, and headed a few stops to Marble Arch; once we exited the station, we realized why it was called Marble Arch! It was because right there, right in front of us was THE Marble Arch, which reminded me of the arches in Paris and Rome. Once out on the street, we were amazed at the level of activity; people EVERYWHERE! And what we also noticed was that we were very much the minority; the flavor of people on the street was Muslim. Men, women and children. You would have sworn it was noon, not midnight. Once we figured out our direction, we headed towards the apartment; dodging people left and right. I asked several people along our way, to make sure we were on the right track, and continued our trek. Eventually, after about fifteen minutes, we found our street and our apartment. After pushing the buzzer on what we thought to be our apartment, with no answer, I started pushing ALL of the buzzers, giving no care to the fact that it was midnight; it had been a REALLY LONG day, and I was DONE! Eventually, someone answered a buzzer; they spoke little to no English, and I apologized for buzzing them. At that point, I realized that the "main" door was cracked open, so I pushed open the door and looked for apartment numbers, hoping to find a note or a key, and found nothing! We decided to get our suitcases off of the street and I quickly made the decision to walk over to the Marriott and ask someone, anyone, to call "Jerry", the gentleman's apartment that we were renting. Of course their first question was, "Are you a guest here?" and of course I had to tell them no. The conceirge reluctantly called the number I had, and we reached Jerry; he said that he had just left, and had waited for us for ten hours and got hungry; apparently he did not decipher our updates properly. He said he would be right back, and to meet him at the apartment. He quickly arrived and let us in; the apartment was perfect! Clean, good sized and with a great cross breeze. We apologized profusely for being so late, and he was great natured and so sorry for our long travel day. He told us where we could find a market open at this hour, and said that he was available, if we needed anything. It seemed as though our REALLY LONG day had finally ended. We walked a few blocks and grabbed a few staples for the morning, as I knew I would not be moving very quickly, and would want a slow and gentle start. We had finally arrived in London, safe and sound; I figured it was God's way of slowing me down and keeping me from hitting the streets, as soon as we were supposed to arrive in London. While the day was not the way we had intended it to be, it did give us a down day, that hopefully will preface a great stay in London. 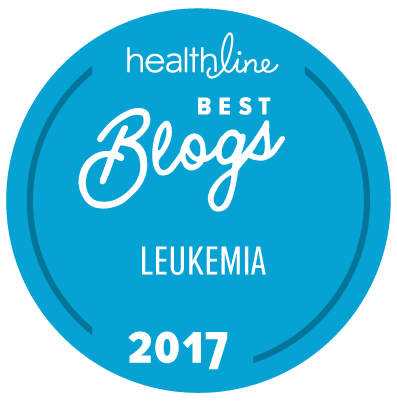 We met remarkable people, and were reminded that the kindness and willingness to share in other's lives are what really matter. 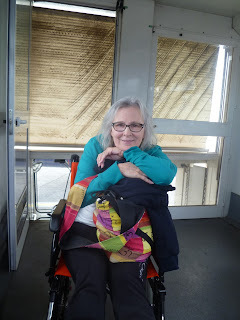 Our travel, wheelchair angel took an extremely stressful day and turned it into one that made everything right with the world, at that moment; she had only been on the job for four days, and made a difference in my life. As did that dear, sweet lady full of spit and vinegar, yet full of grace; she inspired me and gave me hope, and I pray that everything worked out for her, for her event. And to top all of that off; Ryan Air paid us $560 American dollars, for the inconvenience!!! We only had paid $160 for our tickets, so that was a $400 pit stop, for the win! Guess we have nothing to complain about; Look out London, here we come!